Paul Biva was born in Paris in 1851 just as the Realist movement was beginning to transform French art from its academic roots into the experimental investigations of the late nineteenth century. Although there is scant information about Biva’s life, his art reflects the currents of change that swirled around all young painters during these pioneering decades of modernism. The triumph of the Realist painters at the atypically biennial Salon of 1850-51 set the tone for the second half of the century—experimentation in depicting contemporary life, and an increasing emphasis on the importance of landscape and genre painting as a central metaphor for the changes brought about by the industrialization of western Europe. Realists such as François Bonvin, Antoine Vollon or Léon Bonnat combined their concern for capturing daily life with an interest in the traditional genre of still life painting. Inspiration for this emerging trend sprang from a growing appreciation of the eighteenth-century painter, Jean-Baptiste-Siméon Chardin (1699-1779), whose work had been ‘rediscovered’ earlier in the century. By the late 1840s, Chardin was perceived by artists and critics alike as a seminal figure in the history of still life painting; for example, the November and December 1846 issues of the Bulletin des Arts carried articles on the painter by Pierre Hédouin, as well as a catalogue of Chardin’s works in the December issue. By 1852 the Louvre had purchased several Chardin paintings, and collectors began to seek out his works, often available for only a few francs. Genuine public access to Chardin’s work, however, came in 1860 when the art critic Philippe Burty organized an exhibition at the Martinet Gallery in Paris. Here were over forty Chardin canvases on display for everyone to see. By 1863, still life painting had become part of a groundbreaking direction in art. Traditional images, generally based on the Dutch baroque example, were being supplanted by a new kind of Realist image that emphasized common objects such as cabbages, onions and eggs. This type of still life was relegated to the Salon des Refusés, along with the other ‘challenging’ works by artists such as Edouard Manet. When Paul Biva came of age artistically in the early 1870s, his aesthetic inheritance combined the rich historical tradition of Dutch still life painting and the elegant simplicity of Chardin with the forthright energy and innovation of the contemporary Realists. The years following the Franco-Prussian War of 1870-71 also saw the development of Impressionism with its focus on capturing the transient light and color of contemporary experience. For a young painter just beginning his career, there was much to absorb, understand and explore as he strove to find his own artistic expression. Biva first exhibited at the Salon des Artistes Français in 1878. His specialty was still life painting, in particular flower painting, which was unfailingly well received by the critics. Throughout his brief life, Biva consistently enjoyed positive recognition for his work. At the Salon of 1896, he is described as a “peintre vraiment coloriste!” (a true colorist!) [i]. A year later, his work is held up as a model for the apparently distressing number of woeful still-life painters who “kill” their subjects rather than enliven them. After praising Biva’s beautiful composition, exquisite colors and sense of vibrance in depicting flowers, the critic concludes by saying: “Let us hope that this good taste will find imitators.” (Espérons que ce bon goût trouvera des imitateurs.) [ii]. Because they are generally modest in size, still life paintings characteristically appeal to a broad audience, and Biva undoubtedly was able to earn a comfortable living from his art. Although many of his works are unsigned, there is a clear progression from relatively conventional compositions of flowers in a vase to more enigmatic images of flower arrangements in ambiguous spaces. The influence of Impressionism emerges early in works such as Fresh from the Garden, a signed painting of a basket filled with roses and delicate sprays of white flowers that literally glow with color and light. Like similar paintings by Renoir, Biva’s flowers are created by quick brushstrokes of intense color. The brilliant light contrasts with tinted shadows in yellow, red and lavender. Most curious however, is Biva’s choice of setting. In this painting, it is impossible to determine whether the basket of flowers sits on a tabletop with a highly textured cloth and indistinct wallpaper in the background, or on a path in the garden where the hazy dark forms in the distance might be understood as trees. 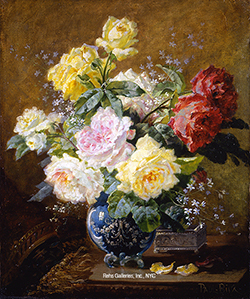 Another work, probably somewhat later, is Still Life with Peonies in a Basket. Here, the basket has become rather sketchy, but the location is clearly a path through the woods, which now take on an almost mystical overtone. Where were these luxuriant peonies growing? How have they come to be placed so oddly in the middle of a sunlit path? And why is the light so inexplicably bright around the flowers while the surrounding forest remains dark? In the distance where the path merges with the trees, there is a mist-shrouded lightening of the dark green tones, almost as if to suggest that the pathway leads to a spirit world beyond the commonplace. Like Jean-Charles Cazin’s landscapes or even Gustave Courbet’s late still lifes of grounded fruit, Biva’s late works are tinged with Symbolist suggestions of immortality and alternative realities. Paul Biva died at age 49 in 1900. Since then, his reputation has been almost entirely eclipsed as more avant-garde works claimed public attention. However, there has been a notable resurgence of interest in his work since 1989 when his paintings again began to command fresh market attention. In addition to his signature still lifes, Biva also painted an occasional landscape such as Cow on a Country Road or Fisherman at the Edge of a River. [i] Gustave Haller. Le Salon, Dix ans de peinture Salon de 1896. (Paris: Calmann-Lévy, 1902). 19. 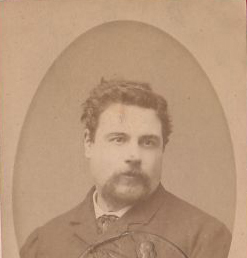 [ii] Gustave Haller. Le Salon, Dix ans de peinture Salon de 1897. (Paris: Calmann-Lévy, 1902). 62-63.